At A.R.K. Ramos, you always get more. Our square inch pricing for cast and etched plaques includes your custom mounting template, all necessary mounting hardware and detailed instructions. NO guess work involved. Our plaque and letter mounting templates are done specifically by hand, ensuring 100% accuracy for each job and easier installation for our clients. In addition, all our products are backed by our limited life-time warranty. A.R.K. 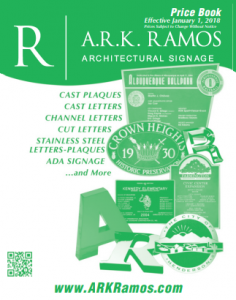 Ramos offers more options than any other manufacturer when it comes to cast plaques. We have MORE standard border selections, more standard texture selections, and endless finish options. We have dozens and dozens of rosette options to make your plaque stand out from the rest; just ask your salesperson. New technologies and computer graphics have let us combine text and graphics in ways that were before unheard of. In addition to this, our products are manufactured to last a lifetime and are backed by our limited lifetime warranty.